Samo Jeranko is an old acquaintance: when he was a baby freediver he came to do a freediving course with us at Freedive Dahab to learn the Mouthfill technique. This was many years ago, and since then he went very far (both horizontally and vertically:). We met him again recently in Dahab during one of his training trips and had the chance to catch up and plan some future things together! I am a professional freediver and current vice-world champion in CWT (Constant Weight) with -108 meters. It all began in 1999 when I started training swimming and continued in 2008 when I did my first freediving course. Since then I have become Master freediving instructor, won silver and bronze medal at World Championships, held my breath for over 8 minutes and even set a World Record in 16 x 50 (sixteen times 50 meters in the shortest possible time), even though this is more of a finswimming performance than a freediving one. I believe that none of it would have benn possible without the great passion I have for training and freediving in general. We don’t like to measure freedivers by their numbers, but since “How deep you go?” is the first question people ask when they learn you are a freediver, we will have to ask you about your personal bests. How do you dive so deep? What do you think is your secret? At the beginning I thought there is a secret, but soon I realized that diving deep is a pure athletic performance. There are many aspects that affect your diving such as apnea, strength, endurance, flexibility and equalization. When you bring all of them up to a certain level you become self confident and most important – relaxed. Therefore, my secret is the systematic approach I have to achieve relaxation when diving deep. Where do you see yourself as a freediver in 10 years? Years ago I decided not to set any goals which can be described only in numbers. 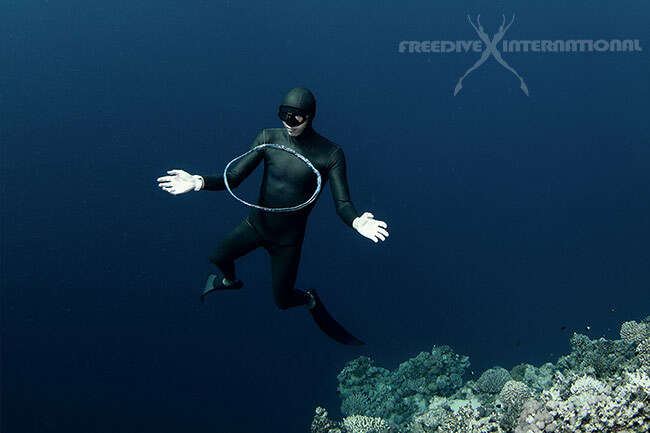 Therefore I see myself as a professional athlete with the knowledge that is valuable for freediving community. I want that my achievements represent values such as devotion, hard work, passion, respect and safety. Freediving for you is a passion, a sport or a job? To who want to dive deep, you recommend they should focus mainly on what? Technique, strength, breath-hold, lots of diving or else? Don’t be afraid to ask for advice and try to learn from other people’s mistakes. Definitely you should learn the technique, be aware of the possible injuries and don’t dive out of your comfort zone. In order to dive really deep you must improve all aspects that affect your diving. If you put aside one of them it will become your weak point and will stop you from progressing. In the worst case you can injure yourself, and this can affect your diving career forever. You had some problem with depth adaptation/lung barotraumas: how did you get over it? There were a lot of mistakes I did and it really took some time to learn something from them. When I started freediving I did stupid mistakes while trying to progress too fast. As a consequence I injured myself and since then I kept suffering from lung squeeze for more than 5 years. It was happening on every dive below 40m. I thought there was no solution for that and I was ready to quit freediving in 2013 if the injuries wouldn’t go away. Then I started discovering how contractions, exhale dives, dry land exercises and my diving approach influence the occurrence of lung barotrauma. I found out that I was pushing too much (due to the mental approach coming from my swimming background) and dive much beyond my comfort zone. Dry land exercises have become an important part of my depth adaptation program. I also invented some exercises that can simulate pressure and helped to adapt even if i was far from the sea. I introduced them to many of the top athletes and the positive effects are astonishing. And this is why we will be getting together and arrange a workshop taught by Samo in our freediving center in Tenerife, Atlantis Freediving. The workshop will be centered on how to train, both in and out of the water, in a way to avoid lung injuries.